What Determines Your Search Engine Ranking on Google? There are many factors that influence how high a business ranks on a search engine result page (SERP) for a particular keyword. Each year Moz seeks to put an actual figure to the influence of over 100 of these factors. Surveying over 30 prominent search engine optimization professionals, yesterday Moz released the 2018 Local Search Ranking Factors. The biggest takeaway: Google My Business (GMB) is an increasingly important local search ranking factor. Compared to 2017, GMB specific signals saw a 32% increase in importance for ranking in the “local pack.” See below for an example local pack. Overall, GMB signals make up 25% of the “local pack” influence. Links still remain an important piece of the equation, accounting for 16% of influence on rank. But the other area that saw increase in influence was reviews. 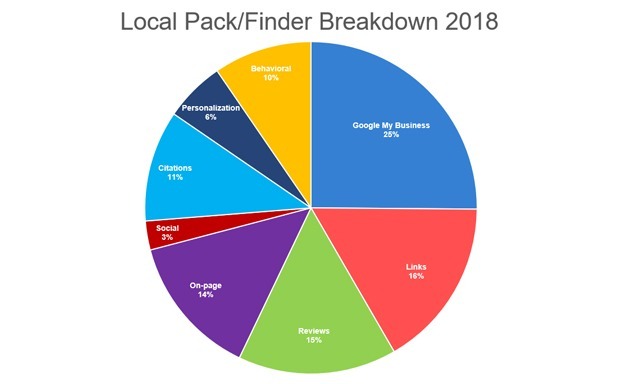 According to the study, reviews account for 15% of influence in ranking in the local pack, a almost 18% increase compared to 2017. Getting back to GMB, the speculated reason for this increase in influence is likely related to Google’s emphasis and focus on local search. With projections showing that of all online searches, roughly half have local intent, Google is seeking to better optimize for these experiences. As a result of this interest, the company has release a number of features that turns GMB somewhat into a social tool. Beyond helping with SEO, businesses can post content, provide a list of services, message directly with consumers, post videos, provide answers to FAQs, and more. All of these elements are playing an increasingly important role in ranking. Additionally, some experts from the study speculate that Google also takes into account “engagement” signals with GMB. In other words, the more engaged a business is with the platform by posting regularly, responding to reviews, answering questions, etc., the more Google sees you’re an active business owner. This may also provide a ranking lift. On the other end, while links to your website from other, high-quality and high-traffic websites is still important, the rise of reviews and GMB as factors appears to be shrinking this influence. According to the study, link signals are down almost 37% in influence as a ranking factor. Again, this isn’t to say links aren’t important, this is simply a noteworthy change. Overall, SEO for local businesses isn’t accomplished with any one particular strategy. The reality is that SEO is a combination of many things: GMB, links, reviews, website signals, social signals, mentions online, customer engagement and more. 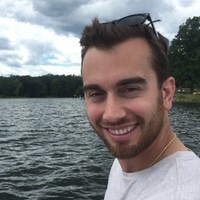 In order to improve rank requires a comprehensive strategy that includes GMB management, Reputation Management, Content Marketing (blogging), Social Media Management, traditional SEO Tactics and more. Contact us to get started.